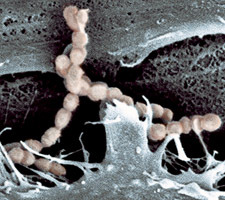 Streptococcus suis is a Gram-positive, facultatively anaerobe coccus. This image is public domain because it was first published by the Lawrence Livermore National Laboratory (for the Department of Energy's National Nuclear Security Administration). Funding: This work was performed under the auspices of the US Department of Energy's Office of Science, Biological and Environmental Research Program, and by the University of California, Lawrence Berkeley National Laboratory under contract No. DE-AC02-05CH11231, Lawrence Livermore National Laboratory under Contract No. DE-AC52-07NA27344, and Los Alamos National Laboratory under contract No. DE-AC02-06NA25396. current 15:19, 6 February 2009 225 × 200 (58 KB) Ashcraft Bacteria (''Streptococcus suis'') Streptococcus suis is a Gram-positive, facultatively anaerobe coccus.